Just in time for major events like Graduation and Mother’s Day, we have a Ink Fridays™ combo pack offer that will make your wallets and printer happy. 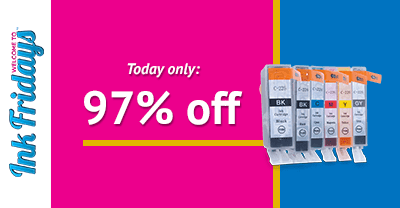 Please cue the drum-roll, the offer is: 99 Cent Canon PGI225 & CLI226 (Pack of 5) Compatible High Yield Ink Cartridges! We did the quick math for you, and we found out you can actually order each ink cartridge for only $0.20. So at only $0.99 for the total set, you’ll be saving 97% off the average retail price of $44.99. This is a perfect deal for stocking up on Canon ink cartridges while saving $44. As always, this specific offer has been especially made and will expire this Friday, April 17th at midnight (PST). A good rule of thumb is to always double check if your printer model matches any printer cartridges you are thinking of buying. We enjoy helping out our customers and have listed out the compatible printer models for this Ink Fridays™ deal. You can also visit this page to see check out those same printer models or find out what compatible printer cartridges we have for any type of printer. If you didn't find what you were looking for this week, stay tuned for next week. We always offer something new and special every Friday, after all, we realize not everyone has the same printer or may be looking for photo paper instead. We'll send you a friendly reminder, if you'd like, before the Ink Fridays™ offer is posted if you join our mailing list. Speaking of reminders, don't forget this discount for 99 Cent Compatible Canon PGI225 & CLI226 (5 Pack) Extra High Yield Black Ink Cartridges expires this Friday at midnight (PST). You start shopping dollar ink here.